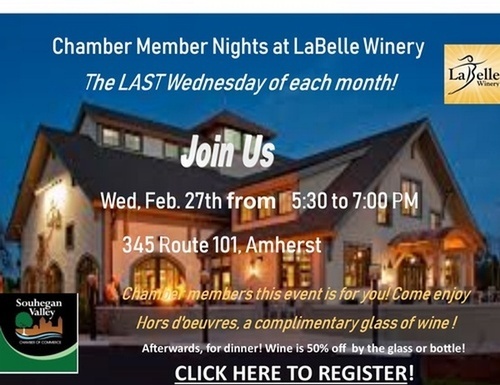 Come network with your fellow Chamber members at SVCC Chamber member Night at LaBelle Winery every LAST WEDNESDAY of the month! Exclusively for SVCC members, LaBelle Winery will host a happy hour from 5:30 to 7 pm, offering members hors d'oevures, a complimentary glass of wine, music, and a beautiful location to come mingle with your fellow Chamber members! 7 til close: Family and Friends get 50% off wine by the glass or bottle!